I arrived in Istanbul on the night train from a cold and gray Bulgaria one winter month, three years ago. Not to be misunderstood, Bulgaria is a beautiful country. However in the dead of winter it can be a little bleak. Thirteen hours on an outdated train and I arrived at my destination. I exited the station and that was all it took. I knew I was staying. Istanbul was unlike any place I had ever seen in my life. I had been travelling for months through dreary post-communist Eastern European countries, in the winter, and I was beat. Walking out of the Sirkeci Train Station (the end location of the famous Orient Express) was like changing the channel from a black and white television to color. Three years later and I am still as taken with my surroundings as I was on that first morning. Every day when I head out into the city I am still amazed by the colors, the vibrancy, the palpable excitement coursing through it’s streets and hills. There is always something to see in Istanbul. Lucky for us sitting and enjoying the views is an integral part of the culture. Here are some of the best spots to take in Istanbul’s beauty. Located in the Eyup District of Istanbul, the Pierre Loti is home to arguably the most spectacular view of the Golden Horn section of the Bosporus. Pierre Loti is named for the French naval officer and author of the book Aziyade, which he wrote while sitting at a café in this location. He was inspired by the views and his love of an Ottoman harem girl by the same name. One visit and it isn’t hard to understand his inspiration. You can take the teleferik (gondola) based near the Eyup Mosque for an exciting whisk up the hill and over the large cemetery. Sit for as long as you like at the café drinking tea or coffee and enjoying the surroundings. I would recommend coming during the week as on the weekends it can become rather crowded. Once you have had your fill of the magnificent views you can take the teleferik back down or you can walk which is a gentle 20 minute hike. Çamlıca hill is the tallest hill of Istanbul’s famed seven. It is located on the Asian side of the city in the Uskudar neighborhood. It is easily reached taking the ferry from Eminonu to Uskudar and then taking the 15E bus up the hill. 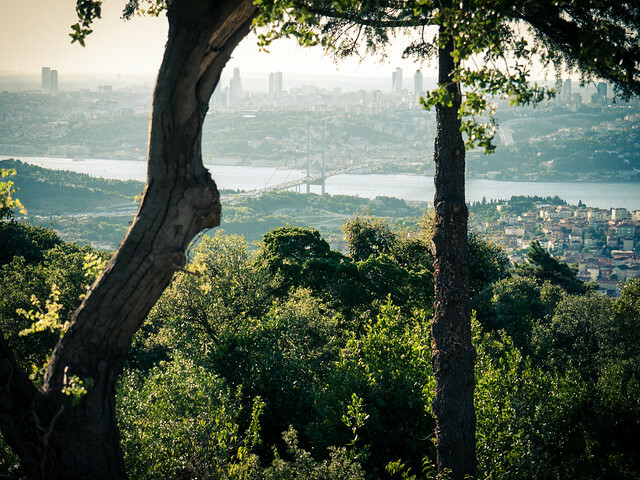 When you reach the top you will be rewarded by some of the most breathtaking views of Istanbul’s European side. There are restaurants and cafes but it is also a very popular spot to have a picnic! It is know for its gorgeous sunsets and is truly spectacular at night when one can see all the lights from the winding traffic as people make their way home. This is probably not the spot to come in the morning as the fog can sometimes hinder your enjoyment of the views. Be prepared to people watch, this is a common place for brides to come for wedding day photographs. Literally translated Galata Tower means Tower of Christ in Latin. This tower located in the Beyoglu district was built in 1348 by the Genoese during the last years of the Byzantine Empire. Originally this tower was part of a defense wall but over the years it has been used as an astrology observatory, a fire tower, a jail and even a launching point for one of the first human attempts at flight by an early Ottoman aviator. These days it houses an upscale restaurant and café and provides a spectacular 360 degree view of the city for tourists and residents alike. There are a few steps you must walk up but a lift takes you most of the way to the observation deck 52 meters above the city. Once you reach the top you can walk around the tower and take in the surroundings. Later, rest at the base café and enjoy a nice cup of tea or smoke a nargile as the Turks do. Buyer beware, some people have balked at the 13 tl entry price to the tower. I however think it’s a small price to pay for such incredible views and enjoying a little bit of history. 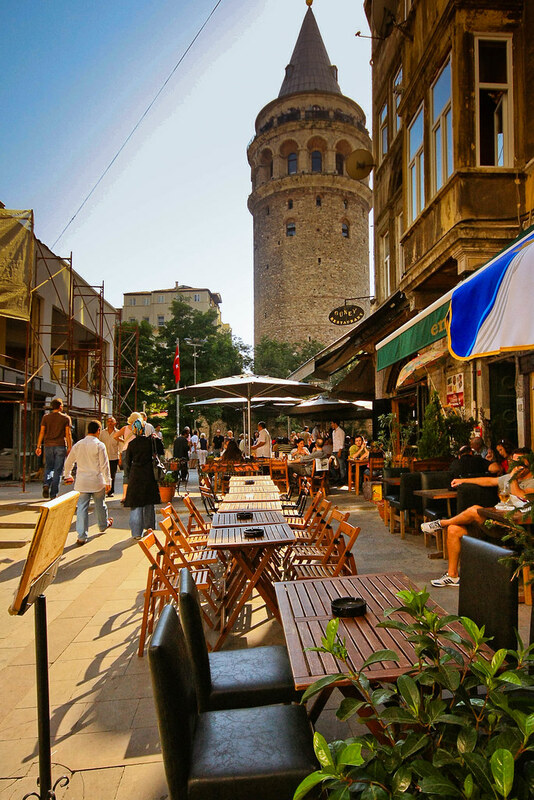 While you are in the Galata neighborhood checking out the tower you may as well walk on down to the Galata bridge to enjoy some more of what Istanbul has to offer. Galata bridge spans the Golden Horn. It isn’t the first incarnation of this bridge but actually the fifth. This most recent rendition was built after the previous much loved floating bridge was partially destroyed in a fire. It can still be seen further down the Golden Horn docked in Haskoy. However this bridge still has its charms. The upper level is home to all numbers of street vendors as well as fisherman standing shoulder to shoulder, hoping for a bite. The lower level is lined with fish restaurants and bars with indoor and outdoor seating alike. I wouldn’t recommend getting a meal, it is typically pricey and frankly average. However this is one of the best locations for grabbing an early evening beer and watching the sun set. The Golden Horn is incredibly busy with ferryboat traffic and it is fascinating to watch the boats cruising, the sea gulls soaring all the while having the fishermen pulling fish up from the water. The view of Sultanahmet and the mosques is unforgettable. If you stay long enough there is generally live music at most of the establishments as well. 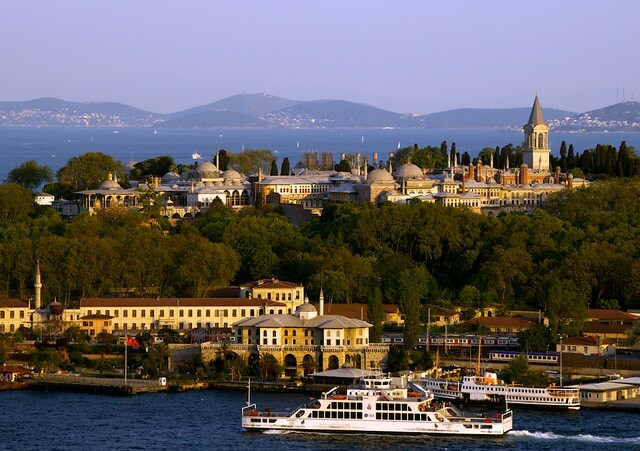 Topkapi Palace, former home to the Ottoman Sultan’s is positioned on a peninsula, which allows for the most spectacular views of the Golden Horn, the Bosporus and the Sea of Marmara alike. This impressive complex was turned into a museum in 1924 after the fall of the Ottoman Empire and the establishment of the Republic of Turkey. The beautiful gardens of the palace, which slope down to the sea, have now been turned into a public park meaning you don’t have to pay an entrance fee to enjoy the sensational views. However if you chose to visit the palace, come early, lines can get pretty long and the palace closes early.